A Twist in History: "A Reminiscent Chapter from the Unwritten History of Barb Wire..."
"A Reminiscent Chapter from the Unwritten History of Barb Wire..."
Jacob Haish published an account of his life, aptly titled "A Reminiscent Chapter from the Unwritten History of Barb Wire Prior to and Immediately Following the Celebrated Decision of Judge Blodgett, December 15, 1880." Local historian Steve Bigolin says this pamphlet is considered to be Haish's memoirs, and tells Haish's personal account of his barbed wire business and lawsuits. Bigolin said neither Joseph Glidden or Isaac Ellwood had put anything into print quite like Haish had with this piece. "It was unique to Jacob," Bigolin said. "And interestingly enough, he waited until Ellwood and Glidden were deceased to print it. Makes you wonder, doesn't it?" Not too much is known about the pamphlet, which is considered a rare item, Bigolin says. 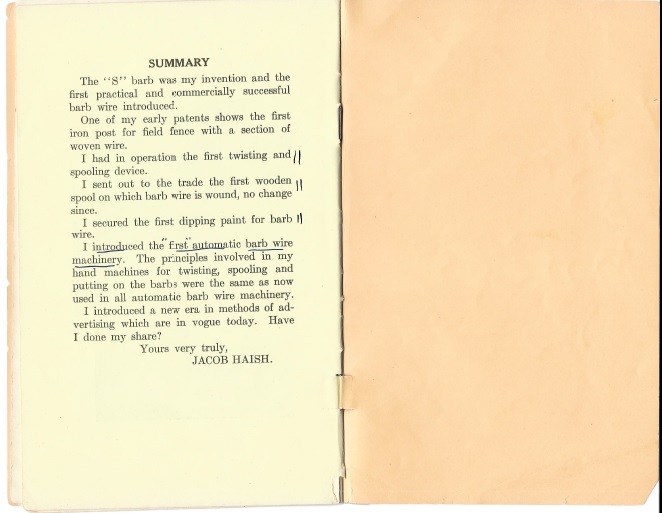 Bigolin said some tend to think the pamphlets were just another product of Haish's, perhaps a giveaway like his barbed wire canes. Thanks to the Ellwood House Museum for providing a copy of the pamphlet, which is printed in full below. Dating back 37 years to the first inception of an idea to provide for a better safeguard for growing crops than the ordinary board fence, and to lessen the expense as well, is certainly an interesting period to consider, as it formed an epoch in the world's history of no mean proportions. Prior to this time some two or three others had conceived a faint and altogether impractical idea as to what was needed, but had never sought to improve on the same. It remained for the growing west to develop the art to its fullest perfection. That our own City of DeKalb should have sent out the first successful barb wires to a waiting world, is a proud distinction worthy of a monument proclaiming the fact. A product of such world-wide use should certainly have a recognized birthplace, and it is a wonder that some one has not been stirred along this line. 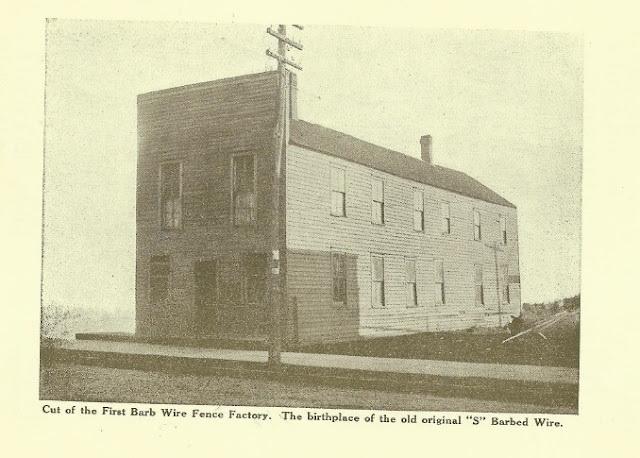 The subject of barb wire is very interesting to me, as you may readily suppose, because I was probably the chief factor in its development, as I was surely the target at which everybody aimed, who belonged to the opposition, as well as the fountain-head of counsel to those who allied themselves with me. It is interesting because it introduced me to men engaged in the large industrial enterprises of the nation, people of high ideals and heads of organizations known for their business sagacity. It also disclosed to me the greed and avarice that often impelled officers and stockholders of great corporations to pounce upon the weaker members of enterprises working along similar lines. So much by way of preface. As a lumber merchant and building contractor from the year 1857 to 1872, I was in constant contact with the lumber interests of the west, and had often noted the immense cut of fencing material increasing yearly, and its bearing upon agricultural interests of the country with its burdensome cost, which led me to think out and provide a substitute therefor. You may well imagine my efforts were very crude when I state it was in my mind to plant osage orange seed and when of suitable growth cut and weave it into plain wire and board fences, using the thorns as a safeguard against the encroachments of stock. Some of you may remember that in the late 60's and early 70's, the planting of willow slips and osage orange seed was at a fever heat. I had received a consignment of osage orange seed from Texas, supplying some of my customer with same at $5.00 per pound. Of course I soon discovered the futility of the osage orange idea and commenced a somewhat random thinking along other lines. It never occurred to me that the Patent Office might disclose some knowledge of prior use or state of the art, in fact at this time I hardly realized the purposes of the Patent Office, or the need of its services, but later on it behooved me to seek knowledge of friends familiar with its workings, and immediately get in line to protect my interests. My ignorance was almost my undoing, and two or three special trips to Washington, D.C. became necessary to put me "en rapport" with its system. I recall with what feverish eagerness I labored to invoke the Goddess of the Patron of Arts to divulge to me some better and cheaper method of lessening the expense of fencing material. In a faint way, like a far off vision, not as clear as "John's on the Isle of Patmos," I saw the coming of a new era in fence building. First was the osage orange, next, attachments of metal to wood. At this time I saw, as in a glass, darkly, later, I saw wire married to wire and no divorce. It was then I saw face to face, clearly that this was the line along which to work. It looked simple, I might say foolish, just a short piece of wire coiled between its ends around a straight parallel wire. I showed the device to a friend and he exclaimed, "Oh H---, Joe Glidden is working on the same thing," without stopping to investigate what "Uncle Joe" had. You see the "King's business required haste" just now. I immediately switched to another form and manner of applying a wire barb to a plain wire, which proved so much easier to make by hand and fasten onto two plain wires, instead of the one that I adopted it, concluding to let "Uncle Joe," and what he was working at, alone. In my thought I bid him God-speed, keeping my own counsel --- sometimes this is wise, but not always --- completed what is known as the "S" barb, and proceeded to its manufacture. While "Uncle Joe" was working in his pasture lot, winding his experimental wire on an empty nail keg, twisting it as best he could, I had transformed the second story of my carpenter shop, a building about 40 feet long, into a barb wire factory, having invented a twisting device as well as a spool --- same as used today --- and small hand machines to form a straight piece of wire into the form of a letter "S," I commenced operations. The twisting device was placed at one end of the shop, the spool at the other end, with a connecting table between on which to spread the barbs and run two parallel wires from the twister to the spool. The barbs being "S" shaped, were easily inserted between the wires with thumb and forefinger, then closed tight with a slight tap of a hammer. Four men worked at a table, two at each side. Each table was supplied with two twisters and two spools. When the barbs had been inserted between the wires and closed down, the one man revolved the twister and the other acted as brakes-man for the spool. The barbs were first cut into short straight lengths by men, then taken by boys who placed them between two lugs fastened to a spindle and turned with a crank which formed the letter "S." These were taken to the table and spread along its entire length. Thus the "S" barb became a marketable product long before a patent was issued for the same. Uncle Joe had a harder problem to solve than I in getting his coiled barb strung onto a single wire. Even after Isaac Ellwood had become a partner with Mr. Glidden, and were working under roof, it was a novel sight to see a workman mounting a windmill tower, standing on the corner near the present Glidden Hotel, and with a pail full of loose barbs, while another workman carried up wires to the platform from which elevation the barbs were slipped over the ends of the wires, to be carried across the road to the building near by, for the farther process of separating the barbs the proper distance along the wires, greasing the wire to facilitate the work and then pinching tight to hold them in place while twisting. With my more practical knowledge of mechanics and business experience, with skilled workmen in my employ, I was in a position to make progress much faster than Uncle Joe, who prior to Isaac Ellwood's introduction to the Guild, was working out his problems alone. Unwittingly I became the leader and advance agent of the new era in fencing --- of followers there have been many --- yet the principles involved in my inventions of the twisting and spooling device have never changed, but used on all subsequent machines. It was these devices that made barb wire a merchantable product. The first spool of barb wire ever shipped to California I packed in a half barrel. It was considered dangerous to ship such a long distance in any other way by the railroad companies. In many ways the Glidden barb found the road much easier for my having preceded it. To preserve the wires from rust was the next step to be considered. Paint placed in troughs in front of the twister was tried, but when the twister was revolving, the fresh paint flew in all directions. That was given up. After many trials I succeeded in securing a dip paint, or varnish as it was then called, which was very satisfactory. No change of improvement has been made since. I sought to control it and secured its agency, but my neighbors made such a clamor for it that I was forced --- much against my wishes --- to grant their request and allow shipments to be made direct from factory. They were up against a sticky, greasy proposition, as they were dipping their product in raw linseed oil, which was too expensive and of no value as a protection to the wire. It was a wasteful method and the boys who did this work --- you should have seen their clothes. No wonder they were anxious to secure the good results I was obtaining. I would have been glad to have supplied them for a small profit. Had I been as wise as a serpent in these early years of struggle, the history of barb wire might have been a different write-up. It finally dawned upon me to keep things under lock and key was the safest plan. Too many prowlers about with tailor made clothes on to warrant doing otherwise. The curious thing about these early beginnings was the disposition of the people to take sides. The predeliction of our home people was toward the Glidden barb, no doubt the sympathy was with "Uncle Joe." Being a farmer he naturally caught the farmer's influence. When Isaac Ellwood became associated with him it gave a great impetus to, and broadened the popularity of the Glidden barb, as he was well known throughout the county, not only as an extensive hardware dealer, but a politician of some notoriety, and also favorably known as an able and successful auctioneer. On the other hand the friends of the "S" barb, while not as numerous, were loyal and steadily gaining. Yet there existed a certain clique whose slogan was "Can anything good come of Nazareth?" And to this day they wonder whether there did or no. At first plain wire was purchased in 500 pound lots with a proviso that any unused wire could be returned. Later it grew to ton lots and to 5 ton lots, which exhausted the supply in Chicago, the wholesale merchants carrying only small stocks of No. 12 iron wire --- no steel wire in those days, just enough to supply a demand for grape trellis purposes. With Mr. Ellwood's accession to the barb wire fraternity, business began increasing until I was inquiring for wire in car lots. One inquiry to the Washburn & Moen Mfg. Co. was productive of great and far reaching results. They were well known throughout the country as very aggressive. Grasping in their desires and restless under restrictions of any character involving their trade. Withall they were well known as fighters of tried ability in industrial contests which they waged for supremacy. These contests were often the subject of the validity of patents. Whoever crossed swords with them must be thrice armed, and have this quarrel just, or woe betide him. To return this inquiry brought, not a letter, but Mr. Chas F. Washburn to DeKalb. He came into my office unannounced, introduced himself, became my guest, sat at my table, enjoying my hospitality to the limit. He was a fluent converser, with high ideals, with a fine appreciation of art and music. In short a cultured gentleman. The final outcome of this visit was a willingness to buy. The question of patents was fully entered into, with his summing up that they were a bug-bear to many. It was up to me to make an offer, which I did, the price was $200,000. It would have been cheap at that, as I have been told that the lawsuits cost his company $1,325,000. He left without accepting it, but wrote me from Chicago as follows: "Were I in possession of Aladdin's Lamp I might consider your offer." Had he been a typical Yankee and offered me $25,000, I believe I should have accepted it but he did not and I stepped in where heretofore, "angels had feared to tread." I soon learned that he had made a careful and diligent inquiry from all obtainable sources of information and came prepared to do business. As his movements immediately proclaimed in his purchase of the interests of Mr. Glidden in his patent for the tidy sum of $60,000, and a royalty of three-fourths of a cent per pound on all barb wire manufactured by Washburn & Moen Mfg. Co.
Everybody congratulated Uncle Joe on his good fortune --- glad to know he was "coming to his own at last." At this juncture some of my friends whom I had sought to interest in the business with me in furnishing additional capital, were skeptical as to the outcome. They rather urged me to get out while my credit was good. There seemed to arise about those times, agriculturists and stockmen who were thoroughly antagonistic to barb wire. They called the fence inhuman, barbarous, cruelty to animals, etc. They raised the "bogey man" before state legislatures to have laws passed prohibiting its use. Threats of arrest were coming forward frequently. But what of Mr. Washburn? Well he was heard from later on, when notice was served on poor lone Jacob by the United States Marshall to show cause for peaceably pursuing a legitimate business under protection of patents granted by the United States Government. I had yet to learn that patents which had not been adjudicated in the courts were oftentimes a "broken reed" upon which to lean. Allow me to say just here, that among the first patents granted me was one showing iron posts with a section of woven wire stretched between them, identically the same fence now called the Ellwood woven wire. Queer how some things come about, isn't it? At the time Mr. Washburn commenced suit, other manufacturers of barb wire were springing up here and there in the west and it was wonderful to note the contrivances and devices which sought recognition. Every one just knew that his particular design was the best ever. Practically I stood alone, confronted with a lawsuit, the magnitude of which none foresaw. My opponents, the veteran fighting firm of Washburn & Moen Mfg. Co., whose record in many a well contested lawsuit had gained them a reputation in the industrial world as invulnerable. Indeed they thought themselves invincible, and well they might, for they had in their employ the finest legal talent in the land, especially in patent law. They were equipped in every department to rout "horse foot and dragon" every bit of opposition to any cherished plan they wished to execute. Could I have foreseen the mighty struggle ahead, my heart might have gone pit-a-pat. I did feel blue, but falling back on my stock of "Dutch courage," inherited from a long line of German ancestry, accepted the wager of battle and proceeded to map out my line of defense. I have since been informed that they found that after all "The race was not always to the swift nor the battle to the strong." One thing is sure, they learned that Napoleon's statement that, "Victory was on the side of the heaviest artillery," was not a safe guide to follow. The new tactics introduced into the fight were largely of the guerrilla order, very spectacular in many respects, yet catchy in their make-up, but it appealed to the trade, the farmer and the public in general. While my opponents knew well how to take care of the legal end, they were entirely at sea when they sought to catch public opinion, a new era in advertising had dawned which carried them off their feet. Nothing like it had ever before appeared in print, quotations from celebrated authors, caricatures and cartoons of the most grotesque character, poetry --- perhaps not as exalted as Milton's "Paradise Lost" --- yet appealing to the sensibilities and the risibilities of the general public. Anything that carried a point, though it may not adorn a tale, was considered "Persona Grata." It certainly was a picturesque fight from any point of view. 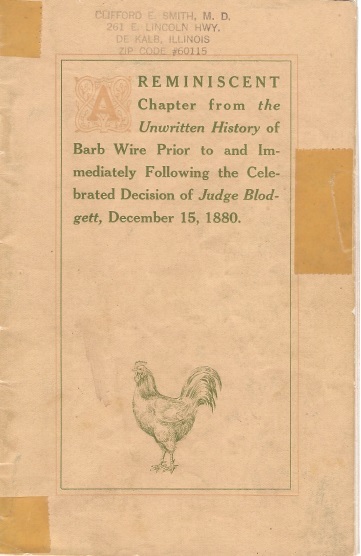 The Barb Fence Regulator, first a four page paper, afterwards an eight page sheet and published annually by the hundreds of thousands, was looked for as eagerly as the New York Ledger, for it not only contained the latest legal aspect of the now celebrated barb wire lawsuits, but short witty stories, poetry, general farm talks, cartoons and whatever else that would interest rural farming communities. I have been told of several instances where this disseminator of polite literature was used in country schools to the edification of all concerned. A general newspaper of this character had never before found its way into hut and palace. It was not long before other manufacturers of barb wire, seeking to exploit their wares, were at my door trying to bring about a combination of all parties concerned, pool the earnings and put up a stronger fight than ever at a less expense to each. Of all that coterie of barb wire manufacturers who were in the field in 1876, I am the only survivor still in the business, with a few exceptions, the others have passed to the "Great Beyond." The litigation which terminated in December, 1880, in a decision unfavorable to me was rendered by Judge Blodgett. Originally the suit was brought before Judge Drummond, but during the progress of the trial some of the opposing force, becoming alarmed at what they thought was the attitude of Judge Drummond in some of the preliminary hearings of the case, called a council to frame up a plausible plea to have Judge Blodgett sit in the case with Judge Drummond. One point of their argument was that the latter judge was getting along in years and it was possible he might not live to see the end of the trial, in which event it would complicate matters and possibly prolong the case indefinitely, to have a new judge step in who was not familiar with the subject matter, and recommended Judge Blodgett for the position. The President of our Barb Wire Union who had authority to act on all matters relating to the litigation, who was a guileless old man, fell into the trap and acquiesced in their wishes. It so happened that Judge Blodgett rendered the decision. And it so happened that Mr. Washburn and his attorney, Mr. Dodge, were in Chicago, a thousand miles away from home, stopping at the Grand Pacific Hotel like "Johnny on the spot," just in the nick of time to hear the decision rendered in the barb wire suit by Judge Blodgett. Curious, wasn't it? Sort of a mental telepathy affair. By some legerdemain there was a failure to send me or my attorneys notice of such an important event to me, especially so as I was the defendant.. Some time after the decision the Washburn & Moen Mfg. 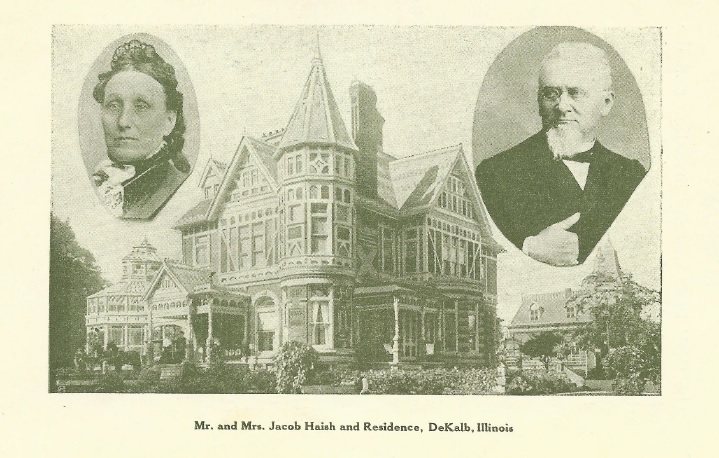 Co., built their plant in Waukegan where Judge Blodgett lived. An electric thrill has always run rampant through my nerve centers, as to what chapter in the world's history induced this important industry to locate in Waukegan. It might have been an act of gratitude on the plaintiff's part, who can tell, as the Mohammedan says, "Allah knows." Of course after the decision there was a grand scramble to get into the band wagon. Every mother's son was now on the jump for a license. I was the only one who held aloof. Mr. Washburn made the terms which they were only too ready to accept. Paying a royalty was satisfactory as long as the business brought good returns, which it did for a number of years thereafter. But soon some of the avaricious ones and jealous withal, were raising a hue and cry that Haish was doing a lot of unheard of things, defying the courts and interfering with the preserves, etc. During the interval the attorneys on both sides were arranging a settlement between Mr. Washburn and myself, that would be mutually satisfactory to all concerned. It was conceded that my claims on automatic machinery for manufacturing barb wire were foremost, as I had built the first machine of its kind in the world and secured letters patent thereon. Mr. Washburn's attorneys conceded my claims to be of great value. This being true, it simply became a game of "I tickle you and you tickle me." So I paid the Washburn & Moen Mfg. Co. 75 cents per 100 pounds royalty on wire and they paid me 75 cents per 100 pounds royalty on machines. Easy, wasn't it? After this happy event the clamor ceased and every one settled down to enjoy the peaceable fruits of --- no, not righteousness --- but of mammon. Since then many changes have taken place. Many old familiar faces are missing, reminding me forcibly that "Father Time" has lengthened the span of my earthly pilgrimage beyond the allotted time of man's sojourn, and for what, can you tell? I wish I could. Let us hope it is for the best good of the people in the midst of whom I dwell. Surely the people with whom I am acquainted, and with whom I have associated so many years, are more dear to me than strangers. The kindly recognition received from old and young from day to day is a tribute to the thought, and answers my question. The "S" barb was my invention and the first practical and commercially successful barb wire introduced. One of my early patents shows the first iron post for field fence with a section of woven wire. I had in operation the first twisting and spooling device. I sent out to the trade the first wooden spool on which barb wire is wound, no change since. I secured the first dipping paint for barb wire. I introduced the first automatic barb wire machinery. The principles involved in my hand machines for twisting, spooling and putting on the barbs were the same as now used in all automatic barb wire machinery. I introduced a new era in the methods of advertising which are in vogue today. Have I done my share? The final page of the "Reminiscent Chapter" by Jacob Haish.